This is the prefect purse for when you're ready to hit the trail! Painstakingly handcrafted, the top lid on this purse is actually a miniature saddle tree. The handle is two-plait braided leather, with sturdy rivet and dee ring attachment. 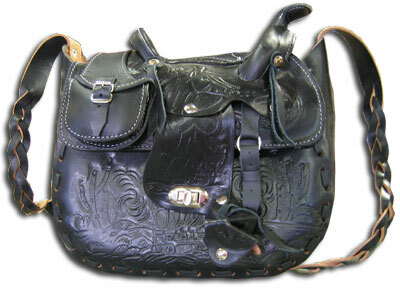 The saddlebag is a functional change purse. The sides are tooled the whole way around, and are a combination of many designs to help the purse go with any tooling pattern that might be on your other apparel. The purse measures 10" Long, 8" Deep, and 5.5" wide.